Highlight your entrance with homemade garlands using fresh greenery from your own yard. Collect branches of pine, evergreens, and magnolias. Trim the branches so that they are roughly the same size, then overlap the branches going in the same direction. Tie the pieces together with florist wire, using the leaves from the next branch to cover the wire. Hang the garland from nails or hooks or drape over your door frame and light fixtures to display. You can also use homemade garlands to line staircases and to decorate fireplace mantles. For a whimsical touch that children of all ages will enjoy, collect a variety of empty boxes in different shapes and sizes. Square, rectangular, and flat shapes will work well. If you can, also get a few styrofoam balls in similar sizes. Wrap each shape in solid colored wrapping paper. Red, purple, yellow, green and blue are good colors to choose. Then, take some colored transparent plastic, or cellophane in coordinating colors, and cut the paper to extend from each end of the box and balls. Roll the paper around the shapes, tape to secure, and twist at each end to look like giant pieces of candy. Use the candies to decorate your yard, around the Christmas tree, up stairways, and on mantles. If you don't have a real fireplace for hanging stockings, fake one with some canvas and chalkboard paint. This project is a fun holiday decoration, especially for small apartments and dorm rooms. Riches suggests that candle making is one of the coziest ways to transform your home around the holidays. Add glitter and infuse scented oils into the wax, and bring it all together with some festive charms or ribbon at the end. You can have your house smelling like that sweet little bakery down the street, and light up any room with some extra ambiance. Taking it one step further, Cristina even has her own tricks (like to http://www.blog.birdsparty.com/2013/08/tutorial-diy-tea-candles.html) for personalizing this winter staple by incorporating tea cups. Speaking of candles, instead of buying candle holders for your holiday table, just turn stemmed glasses and dishes (such as wine glasses and sherbet dishes) upside down and set votives and small pillar candles on top of the bases. Use a variety of heights and shapes to add interest to your tablescape. Place greenery, ribbons and ornaments at the base of the arrangement. If this seems too easy, Riches has more fun ideas for taking it to the next level. For a colorful, inexpensive holiday decoration, make a bow wreath. All you need is a hot glue gun, bows and a styrofoam form for this colorful wreath. If bows aren’t your thing, glue ornaments onto the form instead. Use candy canes to add a festive touch to many different rooms in your home. Hang them from light fixtures, doorknobs, curtain rods, mirrors and stair railings for a quick, edible way to decorate. 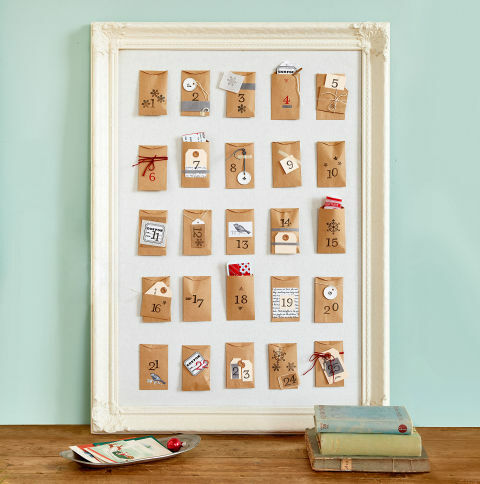 Make your own advent calendar with these simple instructions, little envelopes and some corkboard. When your children bring home holiday artwork from school, save it all in a special box and bring it out each year when you decorate. Drawings and paintings can be framed or pinned on a bulletin board that you hang in the same place each year. Pottery pieces can be used to decorate the holiday table or living room. You’ll treasure each item more with every passing year. Choose your favorite holiday photos from each year and have them printed. 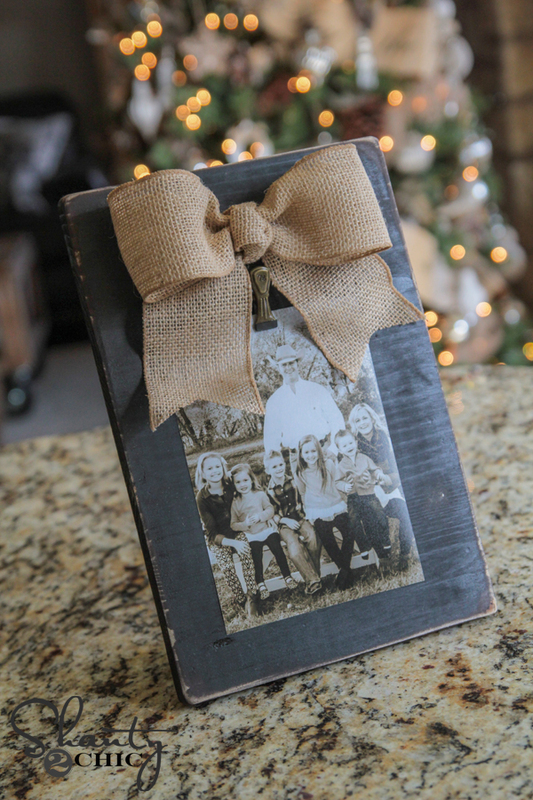 Spray paint inexpensive frames from your local crafts store in colors that coordinate with your holiday décor. Then, display the photos every year on tables throughout your home. Your friends and family will look forward to seeing old favorite pictures and new ones each year. Make it a family tradition to visit a pottery studio each year, and let each family member paint one holiday piece. In just a few short years, you’ll have a collection of holiday dishes that reflect wonderful memories. As you look for new ideas, don’t forget the old favorites of stringing popcorn garlands and construction paper links to decorate your Christmas tree. These timeless decorations are traditional for good reasons. They are inexpensive, easy to do and fun for the whole family. Why not set aside a day or night for your family to show off their talents and work together on some do-it-yourself masterpieces? Our party guru says, "Anything handmade by my kids obviously has a special place in my heart," and, "anything made with love trumps anything store-bought in my view!" So, let everyone choose one decoration they’d like to make, and go to the craft store together to get the materials. Bake some holiday cookies, stir up some hot chocolate and get to work. You might even enjoy it so much that you’ll host a DIY holiday decorations party for friends next year, or create a family tradition that lasts a lifetime. Cristina Riches, aka Bird, is a creative mom of two, published author, graphic designer, magazine editor, party lover and lifestyle blogger.